On the windswept tip of Point Loma is Cabrillo National Monument, which is the third most visited national monument in the United States. From this vantage point, 422 ft high above the ocean, you will be able to enjoy a breathtaking panoramic view of the city of San Diego and beyond. On a clear day you can actually see the San Bernadino Mountains, over 100 miles away. On a clear day you can see the Mount Palomar Observatory 50 miles away. 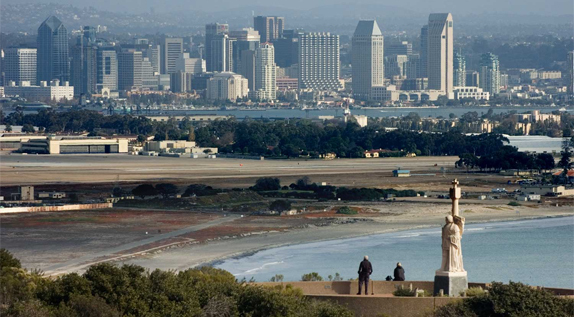 Don’t leave San Diego without visiting this monument and seeing the incredible view. It’s just 20 scenic minutes from downtown, and the views of the city, bay and ocean are absolutely magnificent. 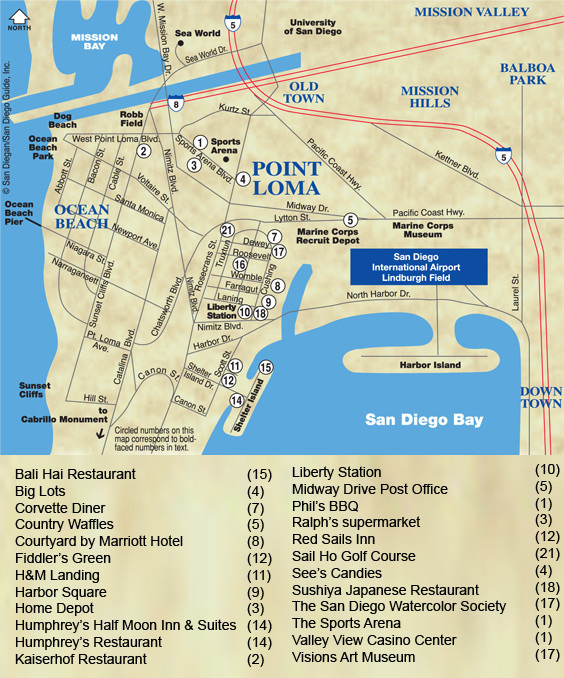 You’ll also get a good perspective of San Diego’s ideal geographic location. The best and least confusing way to get to the Cabrillo National Monument is to follow Rosecrans Street to Canon Street, turn right; go to Catalina Boulevard and veer left (see map). The monument is open daily 9am-5pm, they are closed on Christmas, and there is an entrance fee of ($5) per car, or ($3) for walk-ins and cyclists. Established programs like the Tidepool Education and Restoration Program (which close at 4:30pm daily) and the Artist in Residence Program fulfill our mission to preserve unimpaired the natural and cultural resources and values of the national park system for the enjoyment, education, and inspiration of this and future generations and Call to Action set forth by the Director of the National Park Service Jon Jarvis. In addition they have developed new events, projects and programs for the centennial year to execute our mission and goals such as the Dusty Socks Club, Monumental Memories Photo Book, 100 Words 100 Years Essay Contest and Cabrillo Cake Contest. Beginning in October 2012 and all throughout 2013 an exciting series of centennial events will take place. The official kick-off to the year long event schedule began on December 8th, 2012. 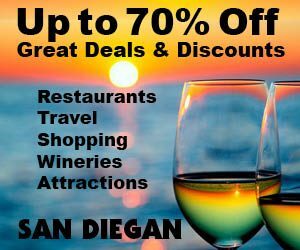 Cabrillo National Monument will host four main festivals during the year Whale Watch Weekend, Cabrillo Bird Festival, Parks and Open Spaces Day, culminating with the weekend long Centennial Commemoration Festival. The weekend long festival will include living history tours of the lighthouse, bunkers, the Cabrillo Cake-off contest and many more exciting activities. The celebration will close with the commemorative ceremony Monday October 14, 2013 at 11am. Be sure to also visit the Tide Pools on the western side of Point Loma, along the rocky intertidal zone. A window into the ocean ecosystem that lies along of San Diego’s coast awaits you. During periods of low tide, pools form along this shore in rocky depressions. In them you may see flowery anemones, elusive octopi, spongy deadman’s fingers, and a myriad of other creatures. The tidepools are a wonderful discovery zone, but be careful if you visit. The intertidal area is a very sensitive ecosystem. Few animals in this ecosystem can harm humans, but many animals are sensitive, and can even be killed, when handled or just touched by humans. On your way to or from the Cabrillo Monument, consider stopping by the Fort Rosecrans National Cemetery and it’s many veterans memorials. The USS Bennington monument is a tall granite obelisk dedicated to the men who lost their lives on that ship in San Diego Harbor on July 21, 1905. The monument was dedicated on Jan. 7, 1908. The Ommaney Bay CVE-79 monument is an etched granite memorial to the men lost in action when the ship was bombed in January 1945. The granite Taffy 3 monument was dedicated on Oct. 24, 1996, in memory of the men who died during the 1944 Battle of Leyte Gulf (Philippines) and in subsequent battles of the Pacific. The granite USS Gambier Bay monument was dedicated on Oct. 25, 1996, in memory of the men who lost their lives during the 1944 Battle of Leyte Gulf (Philippines) and in subsequent battles of the Pacific. Family members and survivors donated the monument. 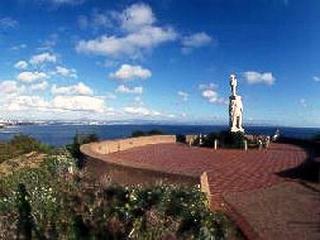 In 2013 Cabrillo National Monument will celebrate 100 years as San Diego’s only National Park. 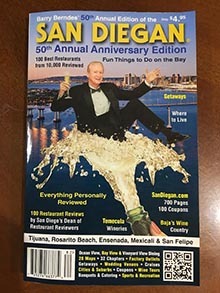 To celebrate this historic milestone their goal is to cultivate and expand connections within the San Diego community, recruit 100 new volunteers, develop friendships and working relationships with 100 new organizations within the county. To accomplish this goal they will strive to inspire and engage the community all year long and into the future looking forward to 2016 when the National Park Service celebrates its 100th anniversary. 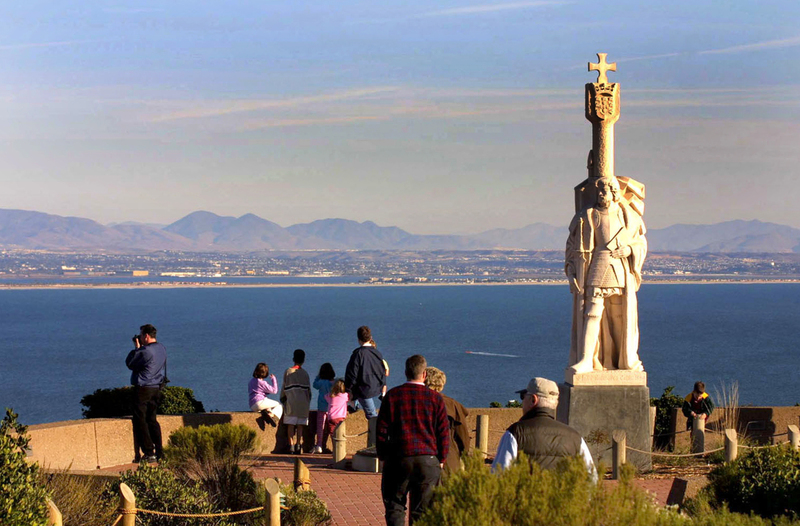 On October 13th, 1913, President Woodrow Wilson, by presidential proclamation, established a modest one-half acre site on Point Loma to erect a “suitable monument” honoring the 1542 discovery of California by Juan Cabrillo. 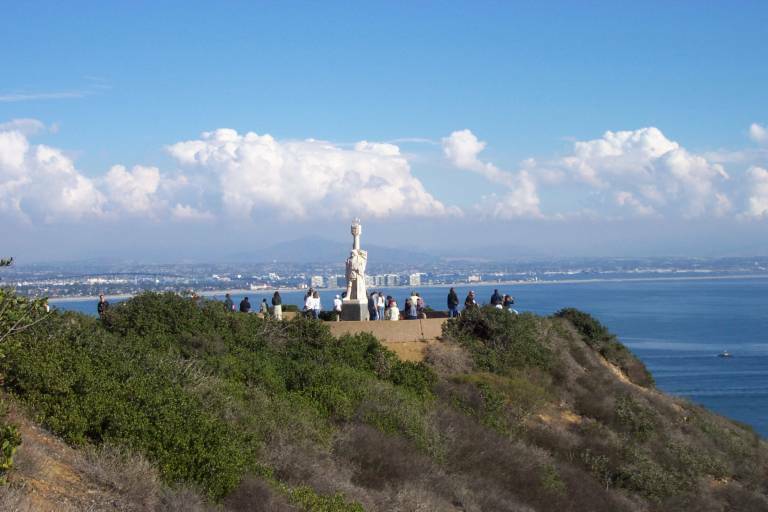 Today, that modest monument has since expanded to host 1.5 million visitors a year while embracing nearly 160 acres of Point Loma’s premier cultural and natural resources. Thanks to the support of individual citizens, community groups, private foundations, and government agencies Cabrillo National Monument has been able to preserve one of San Diego’s greatest treasures for four generations. You are encouraged to join in supporting the centennial celebration through partnering, volunteering, or attending one of the many centennial events planned for 2013. Cabrillo National Monument is celebrating a one hundred year success story built on conservation, preservation and community partnerships. Through your involvement they can continue to champion the importance of preserving our Nation’s cultural and natural resources for future generations to enjoy.